How well you conduct your inspections can be the difference-maker for securing high-value contracts from your customers. And as with most other segments of the gear industry, inspection continues striving to attain “exact science” status. With that thought in mind, following is a look at the state of gear inspection and what rigorous inspection practices deliver&mdash;quality. A response to last issue's "Ask the Expert" feature on efficiency of hypoid gearing. Gleason's GMS analytical gear inspection systems provide all the right features at Eaton Corp. The complete Product News section from the June/July 2012 issue of Gear Technology. The complete Technical Calendar from the June/July 2012 issue of Gear Technology. 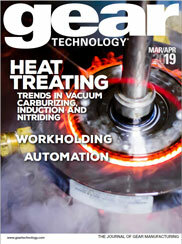 The complete Industry News section from the June/July 2012 issue of Gear Technology. The ultimate Renaissance man was also a gear man. Addendum pays tribute to Leonardo da Vinci.